Lace makers from the northern city of Vologda made a name for themselves centuries ago with their intricate designs that changed with the times. Feminity is always in fashion, and Russian lace has always been a fashion must have. It is not only about collars and cuffs: Fashonistas suggest dressing with laced material from feet to the head. Skilled workers in Russia’s north were engaged in weaving from gold and silver threads in the 17th century, and the world-famous domestic brand "the Vologda laces" was highly appreciated at the international exhibition in Philadelphia in 1876 and in Chicago in 1893. They were awarded gold medals at exhibitions in Paris 1925 and in Brussels 1958, received the grand prix at the Parisian exhibition in 1937. 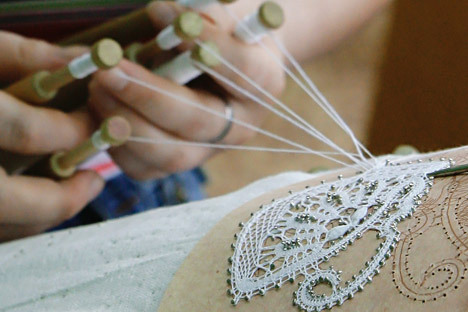 The skills and the imaginations of the Vologda lace workers can only marvel. Their laces today are worked manually on special pillows supported by "koklyushka," wooden sticks on which the tail part of a thread is fixed. Drawings of future designs are put on the special rolling pins and developed by each artist individually. Designs range from geometrical figures, flowers, fishes, birds, deer, or lions. And also fantasy symbols such as unicorns or a natural phenomena, like the polar lights. Or human figures: ladies, gentlemen, riders, peasants in kokoshniks and sundresses. Images of architectural buildings, churches, bridges, arbors, or even palaces are common. Vologda lace makers of the 1930's often used Soviet images in their designes, such as a tractor or planes, as the whole country was seized by idea of construction of the progressive future. "Lace makers created new ornamental compositions with Soviet symbols (a sickle and a hammer, five-pointed stars, or the coats of arms of the republics). There were even images of parachutes, trains, and steamships. Masters managed to transform technical novelties of time to decorative images, to enter them in vegetable motives, without having destroyed the ornamental nature of the Vologda lace," said a history experts in Vologda laces. At the beginning of the 20th century, lace weaving in the Russian north was done by about 40,000 skilled workers. There was not only a school, but a training system which trained experts starting as early as 5 years old. Handicraftsmen and dealers who sold the thinnest matter to capital cities and then exported them abroad. The Volga lace brought a bigger profit when they sold to Europe. But by the beginning of the 20th century, the Vologda lace became an independent brand and was bought up actively by foreign merchants. Before the revolution, it was actively used for decorating female dresses and accessories, made into cuffs, collars and even umbrellas. They produced lacy jacket backs. As the economy grew, the quantity of lacy elements grew also: spouses of successful merchants of that time were already dressing in capes and shawls from lace. During the Soviet period domestic lace began to be considered as excess, and its consumption was minimized. Today in Russia, the old, thin lace from natural threads can be found on the clothes of many Russians, topping items made from more modern materials.